There were no real revelations at Alinghi�s Press Conference in Ras al Khaimah, for those who have been following the America�s Cup saga over the last two years. The �news� that GGYC had threatened yet another lawsuit was no surprise to journalists who have long believed that anything that could be litigated would be litigated. What the weekend did provide was an opportunity to clear up some unanswered questions and experience first hand what Ras al Khaimah has to offer as a venue. If the NYSC ruled that RAK is not a legal venue, would the races be held in the southern hemisphere, or in Valencia? Alinghi did look at the southern hemisphere, but there was a lot less choice than in the northern one, because the total of coastlines below the equator is a lot less than above it. Australia was considered (Grant Simmer would have been happy to see another America’s Cup back home), but there wasn’t really anywhere suitable; there were places with very little wind and very high summer temperatures and places, like Fremantle, with far too much wind for either of the boats. Valencia couldn’t be ready for February; there aren’t the facilities to get boats like these out of the water and inside a workshop. The Alinghi base is on a corner and they intended to build facilities for the catamaran on the land next to the base; for BMW Oracle – sandwiched between other teams – accommodating a 90 foot wide boat would not have been so easy. Then there is the fact that you can’t just set up a race course and hold the event in Valencia, you need permissions from various Spanish Government authorities. There is no venue contingency plan, in the event of a ruling against RAK. Why does BMW Oracle want a February match in Valencia? Then there are the possible consequences of racing in the very unpredictable winds that occur in Valencia, in February. After their Extreme 40 experiences in Cowes last year, the BOR guys know all too well the risks involved in sailing in rough waters and gusty winds; do they really want to take those risks in the BOR90, which would be travelling much faster and it would be much further to fall? What do you expect the BOR 90 to be like when it emerges after the latest mods? More cat than tri, more D35 than ORMA. 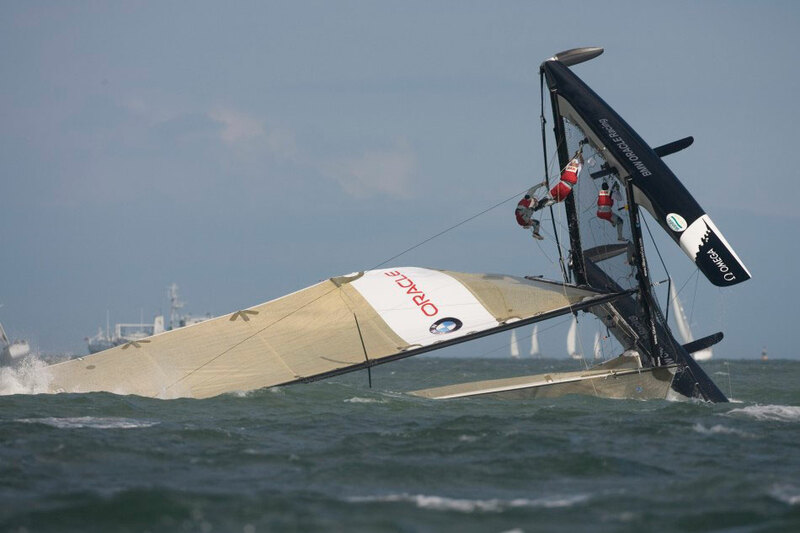 Is BMW Oracle going to use a wing sail? There are enough bits lying around to suggest they will, but can they possibly sort out such a major experiment in the time left. Will BMW Oracle actually race? Some believe that will depend on the performance of the modified boat; others are convinced they won’t show under any circumstances. One recent incident reinforced that latter opinion. The following day, the BOR team members left the Emirate without a goodbye, along with the containers and Extreme 40. Within hours of their departure, GGYC had filed a lawsuit claiming that Ras al Khaimah was an illegal and unsafe venue. Is Alinghi 5 using water ballast? No, but as with many things the option is still open. When will Alingh 5 sail with the new mast? Very soon, the final checks are being done. 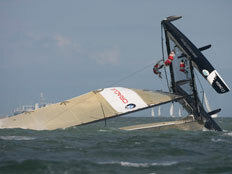 You were sailing with straight boards today, have the S-shaped boards been abandoned? No, all options are open. Asymmetrical testing in Genoa was inconclusive, because conditions are never the same on opposite tacks, so more comparisons are being done now, with straight boards on both sides. How fast is Alinghi 5? That’s a question nobody answers, but it certainly needs very little wind to sail at what would be a respectable top speed for many sailing yachts. I was on a motor cat and at one stage we kept pace, alongside Alinghi 5, for some distance. The motor cat’s instruments showed dead on 10 knots in 3.1 knots of wind. Many people are surprised that Alinghi 5 sits with the sterns low in the water. What is the reason? Rolf Vrolijk explains: “The sterns may sit lower in the water than the rest of the world expected, but not lower than we expected. It is a very different approach and the reason the boat floats like it does is because we have this load waterline limitation within the Deed of Gift; so we had to work around how to get the best performance out of that limitation and we think the concept that we are using is a better concept. Of course, we could have designed the boat differently and, maybe, had a better performance in some circumstances, but it would have been either shorter, or too long. The LWL measurement was the only constraint we had and we took a different approach from what has been common, in what you could call ‘normal multihull sailing’, but the other multihulls you see have either no limitation on length, like the big ocean going ones, or they have a different limitation, like the ORMAs, where it is the overall length that is limited. In all cases, the rules push you in a certain direction and it’s always a compromise, a trade off, but we think ours is the logical thing to do for a catamaran, though not necessarily for a trimaran. If nothing broke, why did you then reinforce the arms by wrapping carbon round them? Is Alinghi 5’s engine a Rotax? The engine is purpose designed, to have the revs come on very quickly, and is built by the Swiss company Suter. What is behind the inclusion of rudders in the measurement rules? You can find an answer to that in one of BMW Oracle's own affidavits. Photos of Amaryllis sailing clearly show that its rudders increased its Load Waterline Length and should have been included in any measurements. The fact that Herreshoff says they weren’t is meaningless, because that was the builder’s choice, it wasn’t measured for a class. This is something that needs to be settled, because not including rudders could lead to all sorts of future abuse. Someone could build a multihull with additional long pivoting hull sections, which would provide a steering effect, and say those were the rudders; that way you could end up with a boat far longer than the Deed of Gift envisaged.